How Close Is Al-Qaida To Defeat? Because U.S. efforts to capture or kill key al-Qaida figures have been so effective, some say the group's core could collapse if a few more members are eliminated. Others say al-Qaida affiliates are gathering strength, and any victory over the core will be a hollow one. How Close Is Al-Qaida To Defeat? 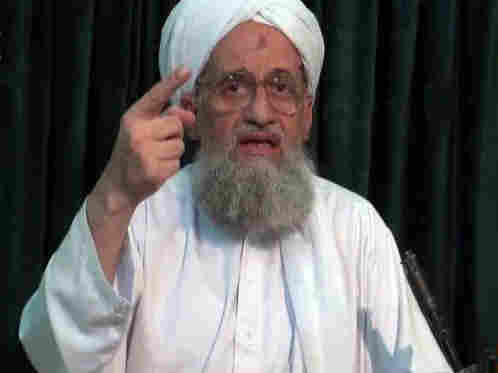 Ayman al-Zawahiri (shown here in a still image posted online by al-Qaida in July) replaced Osama bin Laden at the top of al-Qaida's leadership. Some argue that eliminating a few key leaders would significantly weaken the group; others say the more dangerous threat — from al-Qaida affiliates — would be unaffected by changes in the group's core leadership. A debate is raging in the intelligence community about what it means to defeat al-Qaida. Because America's efforts to capture or kill al-Qaida's key members have been so effective, some officials say the core group — al-Qaida's founders and longtime members hiding out in Pakistan — is near collapse. One camp, which includes members of the Obama administration, says al-Qaida's core group is three to five members away from collapse. Others, however, say with al-Qaida affiliates gathering strength, any victory over the core will be a hollow one. President Obama's top adviser on Afghanistan, Gen. Douglas Lute, is in the first camp. "I think in this succession period that there are three to five key senior leaders in al-Qaida that if removed from the battlefield would seriously jeopardize al-Qaida's capacity to regenerate and therefore move us decidedly further toward defeat," Lute said during a conference at the Aspen Institute this summer. Lute isn't the only one who has made this claim about al-Qaida's imminent demise. Secretary of Defense Leon Panetta has said as much as well. He has talked about al-Qaida being near what he called "strategic defeat." But what sets Lute's comments apart is that he actually put a number on how many people the U.S. would need to remove from the battlefield. [The killing of key leaders] would be a meaningful tactical step toward defeating that specific enemy, but it doesn't speak to the broader terrorist threat emanating from the region — or the broader specific threat from al-Qaida. Michael Leiter is another person who thinks this view has merit. He was the head of the National Counterterrorism Center during both the Bush and Obama administrations. "Could you kill three to five key leaders of al-Qaida in Pakistan and have al-Qaida in Pakistan so significantly weakened that it couldn't launch any attacks against the West with any sophistication? Yes, I actually think that's possible," Leiter says. The list would include leaders like Ayman al-Zawahiri, Osama bin Laden's replacement, as well as other longtime operatives with experience planning attacks. But Leiter is quick to say that wouldn't necessarily end the threat. "It would be a meaningful tactical step toward defeating that specific enemy, but it doesn't speak to the broader terrorist threat emanating from the region — or the broader specific threat from al-Qaida," he says. In other words, the U.S. needs to worry about more than just a handful of bin Laden associates in the frontier territories of Pakistan. Al-Qaida — which means "the Base" in Arabic — is more than just a group, 10 years after the Sept. 11 attacks. It has become a movement with global reach, which makes it much more difficult to defeat. "A movement like al-Qaida that is more than two decades old, even as weak as it is now, its survival isn't predicated on two to three people or four or five people," says Bruce Hoffman, a terrorism expert at Georgetown University. While al-Qaida's core members have diminished in importance, Hoffman says, "it deliberately created itself, as its name suggests, to be the base or foundation to inspire this global radical campaign of violence. We may force the collapse of al-Qaida in one place, but I believe its strategy in recent years has been to replicate itself in other locations." We may force the collapse of al-Qaida in one place, but I believe its strategy in recent years has been to replicate itself in other locations. Those other locations include Yemen and Somalia. For months now, officials have been making the case that al-Qaida's affiliates are America's chief concern. Al-Qaida's arm in Yemen, for example, has leveled a number of attacks against the U.S. in the past two years, and officials say even with the death of its top recruiter, American-born radical imam Anwar al-Awlaki, the group is a threat. Last month, a CIA drone in Yemen killed Awlaki, alongside Samir Khan, another American who produced al-Qaida in the Arabian Peninsula's house webzine, Inspire. But those were independent operations, and al-Qaida's core had little to do with them, officials say. So in a sense, the terrorist threat has moved beyond bin Laden's replacement and the men around him in Pakistan. What's more, other Islamist groups — groups that haven't adopted al-Qaida's name — are starting to target the U.S., and they wouldn't be affected if al-Qaida's top tier was eliminated. Leiter, the former U.S. counterterrorism official, says those organizations include the group behind Faisal Shahzad's attempted attack on Times Square, Tehrik-i-Taliban Pakistan or the TTP, and the Haqqani network. He notes that so far, the Haqqani network has only pursued American targets in Afghanistan and Pakistan and not beyond, but could do so in the future. Outgoing Joint Chiefs Chairman Adm. Mike Mullen told reporters just before he left office that the Haqqani network is a threat to America and is backed by Pakistan's intelligence service. The TTP and the Haqqani network vaguely subscribe to al-Qaida's ideology, but they have a completely different leadership. So Lute's prediction about al-Qaida's collapse may actually end up meaning more to Americans than the new enemies who may be planning to target them.